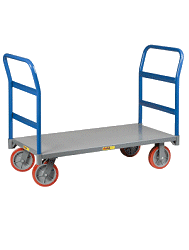 Overall Height: 46" Vertical, adjusts to 61"
Platform Size: 12" x 36"
Toe Plate: 8" x 14"
It is fustrating to use a hand truck with a flat tire. 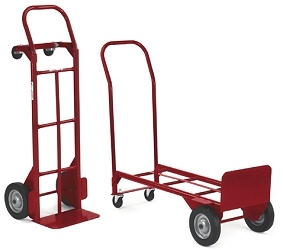 I am surprised that this product, the Milwaukee hand truck Airless, is not sold at the local stores. Thank you for the professional and quality service I experienced. In the future I will recommend your products to the people I meet on a daily basis. I am that impressed!!! Keep up the good work and spread the news. Yours truly, Broward County Deputy Sheriff. Excellent service, great product strong surable, wheels wirk properly what a novel idea! AWESOME The product is excellent and the delivery was timely. It was an added plus to have free shipping and handling. I also appreciate that the delivery was done with respect to printing the address exactly correct. Not a common occurance with many deliveries coming to a huge hospital. I have recommended your compnay to another department as well. THANK YOU for your efficient.